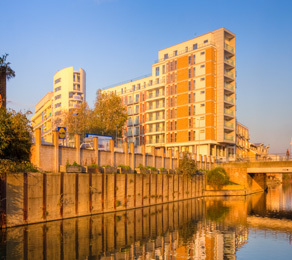 Frances Wharf is a luxury nine storey residential building on the northern bank of the Limehouse Cut, a canal linking the River Thames to the River Lee. Frances Wharf boasts water views and its strategic location gives convenient access to Canary Wharf, the Square Mile, Docklands Light Rail system, London Underground and the attractions of London’s waterways, as well as being within minutes’ travel time of The City, Canary Wharf and Stratford’s Olympic Village. A prestigious development, Frances Wharf offers 90 units and a medical centre. Built to a high standard, the structure incorporates a concrete frame, extensive balconies and roof gardens. CCL was engaged to supply materials and supervise the installation and stressing of the post-tensioning using CCL’s new flat-slab unbonded system to eight levels of the residential block. The main contractor, Lancsville Construction, chose CCL to supply and supervise the post-tensioning works based on its competitive price, quality products and proactive attitude.